Who said that there is only 1 dimension of time in our universe? Physicists, and more specifically those who study relativity. Relativity theory is based on the geometry of 4D Lorentzian manifolds, where one dimension (time) has the opposite sign as the other dimensions (spatial). You could also simply ask yourself "How many numbers do I need to specify the location of an event?" The answer is four. Three of space, and one of time. I don't need two independent time coordinates to tell you where and when to meet me. Our universe doesn't work that way. We can imagine universes where there are two or more dimensions of time, and it makes for some very crazy physics. It also generally makes it impossible to form structure and develop life. If our universe only had 1 dimension of time, then everything in the universe would move through time at the same speed. Sorry, but this is wrong. You misunderstand geometrodynamics -- the mechanics of motion based on geometry. Different rates of time arise from two simple rules: the geometric character of the space-time, and the condition that all observers have 4-velocity with an invariant magnitude c2. I go into quite a bit of detail with this in my posts about time dilation, you can find them in the Astronomy Q&A thread here and here. The basic idea is that the faster you move through space, the slower your clock ticks, because of these geometric rules. A similar thing holds for curvature: for stationary observers, time passes more slowly in regions of stronger curvature. We can work this out elegantly with the various maths of vectors and tensors and differential geometry. It might not be pretty, but it works. This 3+1 description of space-time accurately describes nature. It is also important not to confuse "motion through time" (your change in time coordinate) with "proper time", which is what clocks actually measure. Clocks do not measure your motion through time. They measure the distance you move along your path in space-time. In this geometry, there can be distances of zero, which correspond to null paths like those of photons. 4D Euclidean space is awesome. I had a math professor who dedicates some of his free time to building and 3D printing shadows of 4D objects, and decorates his office with them. But, it's not what explains black holes and wormholes. You can't understand how they work within that kind of space. Do you mean that as in being in the center of a wormhole? As far as I have come to understand with wormholes they seem to gloss over what sort of visual or temporal distortions one would experience. Some wormhole geometries are completely "smooth" which would suggest there would be no distortions besides the spatial distortion which is seen as the lensing effect. I have discussed it with SpaceEngineer before but his view was there would be no red or blue shifting and no anomalies with time, which is why wormholes don't have red or blue shifting in SE. However there are some wormholes that suggest an uneven distribution of mass/energy which would cause "hills" and "valleys" inside the throat. That would suggest that you would see changes in perceived time, but I haven't seen any papers regarding this so my statement was more of a curiosity than a legitimate question. But, it's not what explains black holes and wormholes. You can't understand how they work within that kind of space. I cant understand how blackholes work in 4D euclidean space, but the concept of a worm hole through 4D Euclidean space makes perfect sense to me. The way I conceive wormholes is like this. This is an example of a wormhole for a 2D universe by folding the 2D universe into the 3rd spatial dimension. The image is actually misleading to me because I imagine the wormhole having a very thin throat (almost completely flat) so that the 2d universe fold resembles a rain drop shape where the tip of the raindrop is a wormhole, and the rest of the universe lies in the bulge. Now it's just a matter of thinking of our 3D universe folding back on itself though 4D euclidean space. Where the two spaces meet, a hole through space is formed. This ofcourse would imply that our universe has 4 spatial dimensions, (which may be the only error in my logic) but have you ever considered that we can only ever see a 3D slice of a 4D (Euclidean) universe? Well yeah, this is a very common visual representation for them, to use a connection between points in a 2D space which is curved in the third dimension. But be careful with how far you take it. 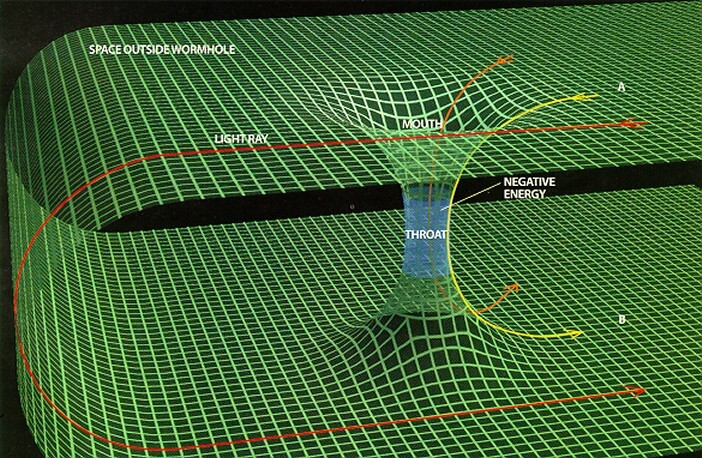 A wormhole is not made by bending 3D space in 4D. It is a curving of the whole 4D space-time, and what we're looking at is a particular 2D spatial slice of that space-time (also with a particular choice of constant coordinate time). In other words this is an embedding diagram. We do this with black holes all the time too, which gives us that famous funnel shape. It's very useful for visualizing features of the gravitational field. But that funnel shape is not the shape of space within a higher dimension. It is a particular slice of the entire higher dimensional space. The curvature is an intrinsic property of the whole 4D geometry. Watsisname, thanks for clearing this up, you have given me a more accurate understanding of the universe which is what always makes me giddy! Cheers! Watsisname, thanks for clearing this up, you have given me a more accurate understanding of the universe which is what always makes me giddy! biggrin Cheers! Always happy to try to explain things or clear up confusion. And hey, sorry if I came across as dismissive or anything -- I don't mean to be. On a related note, I was thinking of time dilation and mountains, and decided to do a quick calculation for how much faster time passed for me while I was on top of Mount Evans, elevation 4346m, compared to my home which is close to sea level. which gives the time dilation relative to a clock at infinity. Do this twice -- once for sea level, and again at the top of the mountain, and take the difference. This yields a difference in time dilation of 5x10-13. That's 3x10-11 seconds per minute, or 1.8 nanoseconds per hour. Neat! If I had an atomic clock with me, that would be measurable. I checked this calculation against an experiment where scientists did use atomic clocks to measure the same effect, and over an altitude difference of one foot, they measured a rate of time difference amounting to 90 billionths of a second over a 79-year lifetime. Which, extrapolating over 4300 meters and converting to seconds per second, works out to exactly the same time dilation factor: 5 parts in 1013. Relativity is awesome. Added: Actually this works out very nicely as 10 nanoseconds per day per 1000 meters elevation gained. This linear relation fails if you extend it too far (like up into space), but it works very well for the range of altitudes on Earth's surface. and not 2560x1440 like it need to be? or i am wrong and it should be like that? The time dilation caused by Earth may seem small, yet that dilation is responsible for keeping us all on the ground. midtskogen, more like the other way around. Gravity caused by earth is responsible for the small amount of time-dilation. What if Earth was the moon of a ice giant in the orbit of Earth? I made a clone of the sun named Zon, I added a Neptune like planet in the habitable zone and put a terra into orbit. I got the inspiration from a book. I need help with making a barycenter for it though. If a neptune mass planet was in the habitable zone of a clone sun, what orbits would the other planets have to be stable? more like the other way around. Gravity caused by earth is responsible for the small amount of time-dilation. It's coupled together, so I think it's instructive to see it from both perspectives. Matter always wants to be where time flows the slowest. Cleverbot: Pong pong ping pong ping ping. User: Pong pong ping pong ping ping. Cleverbot: What's a ping anyway. Welp, I learned why Quantum entanglement must work faster than the speed of light. I just don't know how it works. Such seems to be the case with many areas in Quantum Mechanics. The why part is easy to understand, the how part is seemingly impossible.